This page is still being updated, but below is a general idea of the tractors I've got! I have been pretty busy with work for the last several years, as I have been commuting every week from Tallahassee to Pasadena, CA working on a project. It was supposed to last 6 weeks, but instead I have been doing this weekly trip since December of 2003. 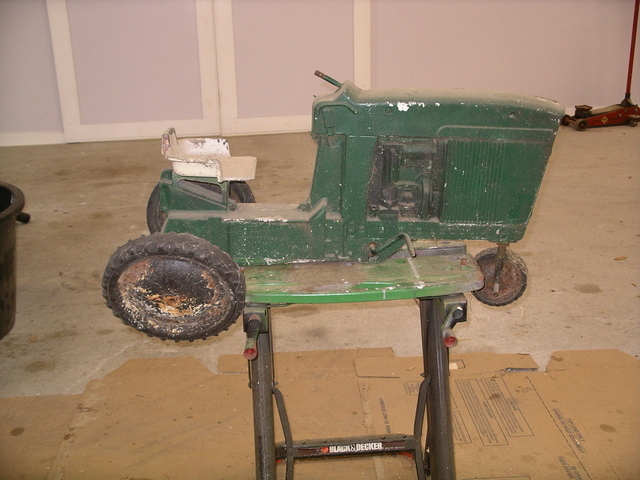 As a result, there's not a lot of time left for tractor projects. In the spring of 2005, I had a 48' x 75' workshop put up by Morton, and most every weekend has gone to trying to finish it out. I also spent a lot of weekends building a 350 sq. ft. heated and A/C'd "Office" in one corner so I can work on delicate things or rebuild an engine or transmission on a stand in a bit of comfort, or at least have an area to cool down in when it gets too hot to stay outside continuously. I just finished trenching the Cat 5/twin phone/twin Sat TV lines so now I have the 36" Sony TV which I demoted to the barn when I got HDTV in my home office, and a Tivo running on separate lines, so now with two phone lines, my wife can place calls to me out there, or even e-mail me. She says it's just like I'm on the road! Ain't love grand! All the concrete work and approaches are done, though the photo only shows it right after Morton was finished except for one lone downspout. The 200 amp electrical service is done, by me with one helper, including a 220V service for my electrolysis 5 volt/400 amp power supply, and welder drops, quad outlets every post in the active areas, and every other post in that storage areas. I have 15 fluorescent HD lighting units, but for now I can't recall the model numbers, but it lights it up real nice. I think after the shelves are in place I might also add a couple of hanging lofts for light weight storage. I figured under that¡¦s a good place to park the 855. Eventually I'll run plumbing for the air from the 8 hp compressor and the Lehman dryer/coalescer, but for now I'll make do with a long hose. Maybe I'll get to the hard airlines this fall. Once the shelves are up, the floor organized, and a semi-permanent paint booth constructed, I'll be ready to start on my next two tractor projects. First up is a couple of D-65 "20" JD pedal tractors that I have to strip and rebuild, then apply some nice base coat/clear coat for my two grandsons who arrived in 2006. I went from zero to 2 grandkids to two in nine months, and since they are 1,000 miles from me in different directions, that has taken some time as well. Thank goodness for frequent flier miles. Now my wife says I need a third pedal tractor to keep at our house for when either of them come to visit. I started on the first one and it has some sort of semi-gelled paint that won't be cut with Methylene Chloride or MEK, and I hate to blast aluminum, and electrolysis is a no-no, so it's the toothbrush-sized stainless steel wire brush and my famous F-I-T Xylene, MEK, Methylene Chloride "cocktail". Like I didn't have anything better to do, jeez. So on to tractors. I currently have a 1956 70D that I reclaimed from under my parents farm barn in Ohio. 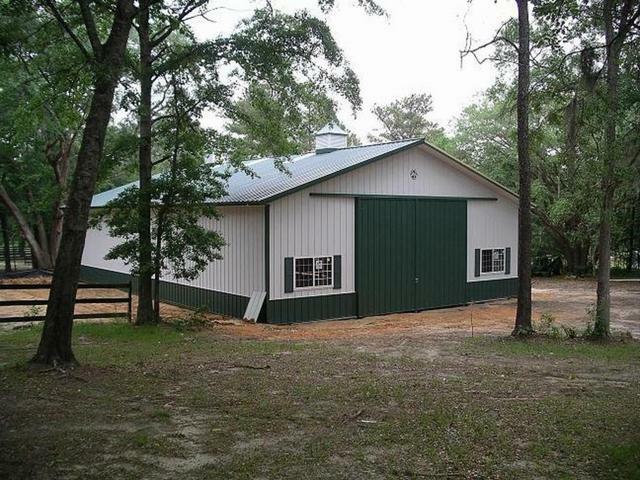 A tornado had dropped the barn on it and it took a Cat track hoe to hoist it out, and at over 7,000 hours on the clock (farmer speak for "she was flat wore out!") more parts and money than my dad would have ever imagined, but it's back to health and I use it whenever I can find a task for it to do. It has been a float puller in a couple of shindigs, and while I think it looks pretty nice (PPG DAR AE and Clearcoat), it's still a working tractor which is fine because I don't go to shows much, and my stuff is just for me to play on. Anyhow, I think that it would be my favorite because the 70 and I go back quite a few years. So the 70D is here because I grew up on it. Next is a '51 VAC Case, which represents my dad's first tractor that he bought after the war when he started out on 80 acres. 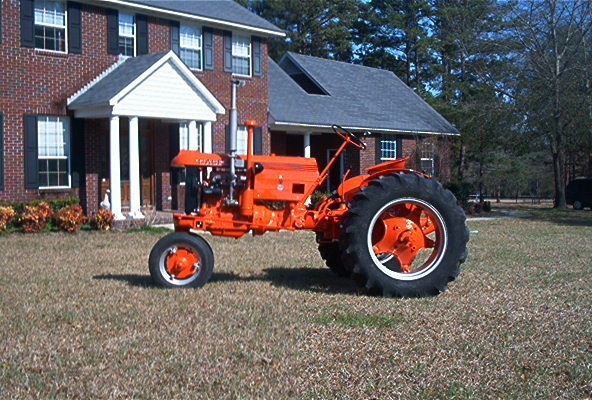 Tractors were hard to find and his cousin had a Case dealership and he corned a new '48 VAC, cultivators, plow, and Detroit sickle bar mower for him, and that is what he started out using. The old VAC was sold to a hobbyist near Dayton around 1970, and I have not tried to track it down, though I doubt that it still exists, choosing instead to find this one which was closer to me (south Atlanta), stuck and troubled nonetheless, and after a significant amount of work (it took $600 in ball bearings alone!! 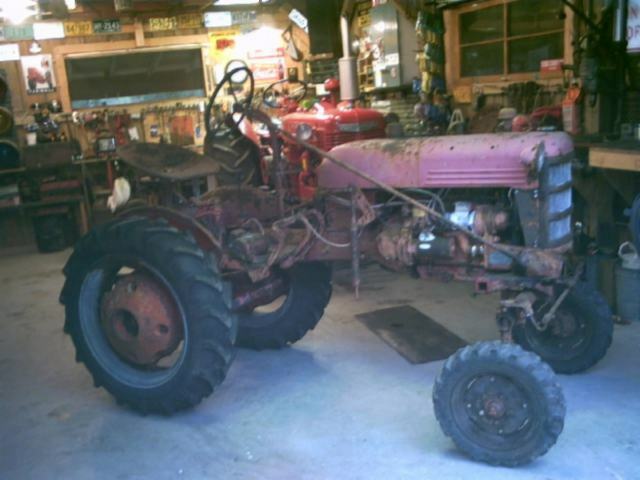 ), it now serves as my "chore" tractor because it is handy with its Eagle hitch and gas engine. I have a nice grill for it that I need to get prepped and painted, and that should finish her up, though she has done a lot of good work for me without the grill over the past few years. So the VAC is here because it is the first tractor we had, and the one on which learned to drive. Next is a '48 Cub that was sitting by the Tampa, Florida coast, and it is rusted in every manner. I should not have even started on this one, and I might change my mind and part it out, but by now I have a re-bored block hanging on the engine stand, and a new piston and crankshaft kit for it, so I'll probably build out the engine, and it may go into a better '48 chassis if I find one. My maternal grandfather had bought a '48 Cub to use in his town garden plots, and every time I went there, he would take me for a ride. I thought it was neat because it was my size. The original resides with my cousin, so one day I'll stop by there and take some good pictures so that mine will be equipped like his, except that mine has hydraulics, and I believe that his did not. I can't imagine him paying for such a sissy option as that! So, the '48 Cub is here because my Grandpa Kalkhoff had one just like it. The photo was taken in the sellers shop just before he delivered it. Next comes a '41 "H" that, like the Cub, is in need of a total rebuild, block bored, pistons, all bearings, etc. It is a hand start with a hydraulic unit. My dad's father bought a new "H" in '39 to replace his last team of horses. They had bought a new "A" in '36 to replace their Fordson and eventually the IHC Titan, so another, smaller JD was a natural choice. The week it was new, Dad (15 at the time) drove it to town with a wagon to pick up a batch of new mattresses that Grandma had bought, and the fellows from the grain elevator across the street looked it over and asked him just where the engine was, because it was so small and compact. Dad said when it was warm and in tune, and if you were wearing rubber soled shoes, you could kick the flywheel over form the seat and go popping away. Grandpa drop checked corn for the first time in the neighborhood by tractor using the "H". They sawed the double tree off the old 999 planter and had the local blacksmith bolt some strap iron on to the tongue to form a hitch. Once they tried to hook their New Holland baler to the "H" and when they cranked up the hitch jack, the front wheels came off the ground. So they took the drawbar to the blacksmith and had him drill a hole farther back so they could slide the drawbar in further and the wheels came back down. And now you know how some of these strange holes show up on our toys 60 years later. So, my Grandpa Boerger had an "H", and now I have one for that reason, albeit my third over the years. I do most of my own mechanical work, including paint and body, but I don't have a good boring mill or valve grinding set up, so I take the machining stuff into town. Since larger bore engines with deep cylinders are not so common anymore, I had to take the block for the 70D to a place in Jacksonville that specializes in tug boat diesels. 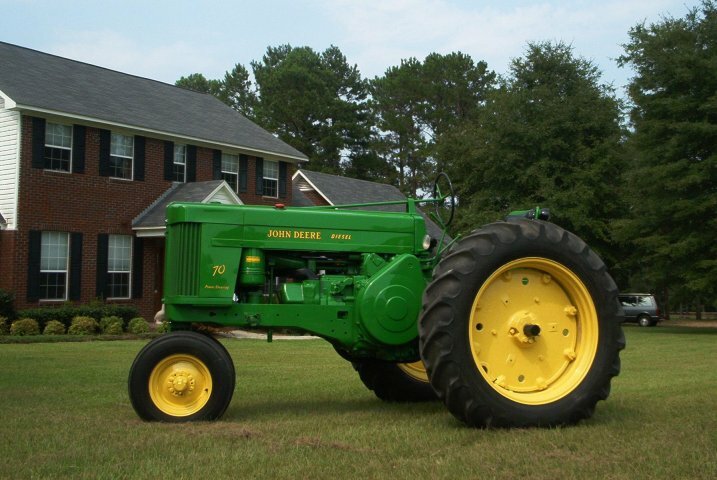 When I called the guy to talk about their services and told him I was working on an old two cylinder diesel farm tractor, he asked "What model John Deere are we talking about? ", I knew that was where I needed to go. Sometimes on this old stuff, you can cost yourself more money running around looking for a low price given to you by a guy who might ruin your nearly irreplaceable part, when another $100 would get you to a shop who has been there and done it before. Sorry this got so long winded, but I wanted to tell you the why on the tractors so that you would understand the reasoning behind the models that I have, and why they mean the most to me. 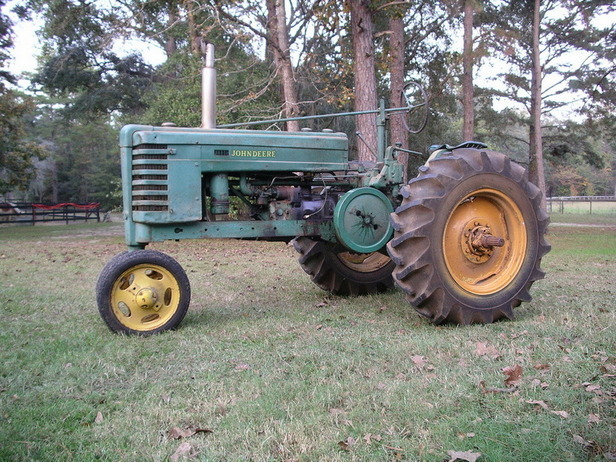 The next tractor I'll go find is a pretty common old '48 , Roll-A-Matic, gasoline, two stick "A¨. #595751 was our "A" for years and it suffered a main case break in the '80's and went off to the junkman, but only after I transplanted the engine into a '49 with a good rear end and bad crank/busted block chassis. It's still running today. I want to get another one of those someday, and that will probably be it. Nothing rare there, just those particular models that make me think back to a special time whenever I get on and fire it up. I wouldn't mind getting a 4020D for odd jobs, but I think even my city-raised wife will see through that one. Still, I think I could find our old one. I think I know who bought it from the guy my dad sold it to. I might have to call Morton again next year.